HIAS 2013 will be held from 8-12 April 2013 by the Department of Nuclear Physics at The Australian National University, Canberra. The first day of the symposium (8 April) will start with presentations from 9:00am, with the welcome reception to be held later in the evening. Note that the University is approximately 15 minutes by taxi from Canberra airport. A post-conference tour of central Australia - to be led by Prof. Keith Fifield - is planned for the period immediately after HIAS 2013. Numbers will be limited. Tour details are available on the Post-conference tour page. Enquires and Questions about HIAS 2013 can be directed to the conference secretary. The venue for HIAS 2013 will be the Manning Clarke Centre (Building 26A), an approximately 10 minute walk from the Department of Nuclear Physics, Building 57 Garran Road, The Australian National University. The Manning Clarke Centre is located on the left side of grid G3 of the University map. 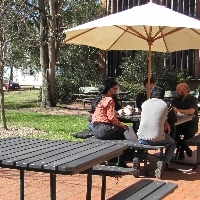 The Australian National University has a number of accommodation options available while you visit the department, including on-Campus apartments and residential halls. 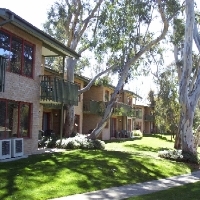 A block booking of accommodation for the period 8 - 12 April has been made at University House and at Liversidge Court Apartments, both on the ANU campus, for attendees. This accommodation is limited. The conference webpage also gives information on other accommodation options nearby that attendees will be able to book themselves. Accommodation booking details can be found on the University Accommodation website.